toddler recipes. indian toddler recipes for 1 to 3 years. As your little one gets ready to celebrate her first birthday, stepping into the fascinating world of toddlerhood, she will be about three times (triple) her birth weight. The stage from her first birthday until she starts school, i.e., from 1 to 3 years is the stage of toddlerhood. These are crucial years for laying the foundation of your baby’s health. Most babies outgrow the stage of eating mashed and bland foods and will now begin to eat more elaborate meals. They are now ready to eat everything that is being cooked for the other family members. Do remember that the food habits formed at this age will hold them good for a lifetime. So you need to ensure that she eats healthy and nutritious toddler recipes. Encourage your toddler to eat whatever she likes and treat her palate to a variety of foods so that she cultivates a taste for new foods and flavours. For you, this stage can be a magical experience, as you will see your baby gaining independence and ability very rapidly. A wonderful healthy toddler soup which has protein from the dal and fiber from vegetables in puree is Dal and Vegetable Soup. Nothing like a Chila which is toddler friendly. Then you have the Mini Bajra Oats Uttapa for your kid. Yes we have made it mini for your little one and packed with nutritients. Chickoo is baby friendly as its naturally sweet and we have made this delicisous Chickoo Milkshake. Remember to remove the thich outer layer of the skin as suggested in the recipe as your toddler will not be able to digest it. For smaller toddlers who are use to Rice water then you can try this fab Rice Mash recipe which is lubricated with ghee to make it easier to swallow. For toddlers, parathas make terrific food since they can be enoyed without parental supervision and you can stuff healthy toddler food in like Paneer Vegetable Paratha. Also a great way to introduce your toddler to to cereals like jowar and bajra is to give them Multi Grain Palak Paneer Roti. Between the ages of 1 and 3 years, your bundle of energy will grow very rapidly, learning to crawl, talk etc. During this period, she will need to be fed more frequently. Unfortunately, right now, her small stomach is not in a situation to cope up with large meals. So, offer small and frequent meals to your child. Also remember not to set hard and fast rules in terms of a particular time or number of meals, because what is really important is not the number of times your child eats but what she eats. You need to emphasize on the quality and not quantity of food she eats. Be flexible as rigidity regarding meal times may lead only to stubbornness. Most babies show a decrease in appetite during this year, as they are busy concentrating on learning other skills. If your baby is one amongst them, do not worry, as they usually demand food when they are hungry and eat what they like. On the other hand, some children might not be able to express that they are hungry. They may get tired, cry or nibble on anything that’s within their reach. Now you need to be more attentive than usual, as your little angel may not understand that she is hungry and will probably realize it only once food is in sight. If she is hungry, she can cry or throw a tantrum too, so you need to be alert and remind her to eat by offering her food at regular intervals. It is possible that sometimes she may refuse to eat for no apparent reason. If you insist on force feeding, meal times will soon become a tug of war between you and your child making her extremely unpleasant and perhaps even lead her to develop an aversion of food. If your little one is not particularly interested in all the foods that you offer and chooses to eat one or two things, do not force her to eat the foods she does not wish to eat. She will surely make up for this lack of eating in her next meal. Mothers are agonized if their baby has had no milk for one day, but it is okay to take a break from regular everyday foods, once in a while. Tempt her with cheese or paneer instead. Some toddlers are also fussy about what they like and what they want to eat. By now, they have strong preferences, which might make you want to tear your hair out sometimes. This situation can be handled if you follow the basic principle of serving your baby the foods that she is already accustomed to and enjoys, while continuing to add new foods to her diet. Fussing over her may convey that eating is a means of getting family attention. 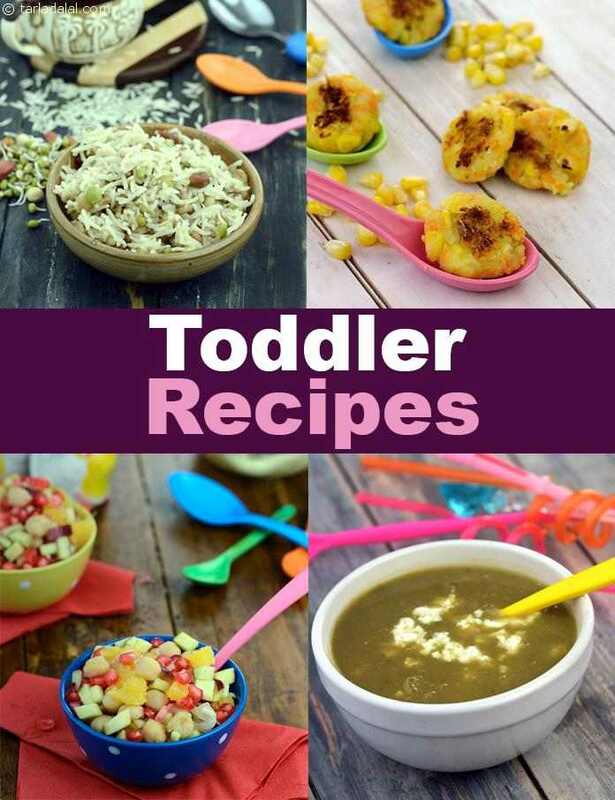 Cook dishes that your toddler enjoys. Also, it is wiser to mask foods she doesn't like by mashing, or puréeing it. You can also mix those ingredients with your toddler’s favourite ones. Toddlers also like variety in terms of textures, shapes and flavours as their taste buds are now almost developed. A delicious snack for packed lunch which your child will surely enjoy in his play school! Sharp or acidic fruits like plums are not easily accepted by babies. But these fruits provide plenty of vitamin c and should be included in their diet. Adding some mashed banana tones down the sharpness of the plums and keeps both baby and you happy. This creamy soup will make your kids fall in love with pumpkin which otherwise is avoided by them. This tricoloured chilas are sure to lease your toddlers and make them eat these healthy nutritious chilas! Encourage healthy eating habits in your kids while they learn about size presenting these multigrain squares! Golgappu loves to discover how some of his favourite foods are made and from what they are made. Come and discover with golgappu the journey of potato from the farm to fries, in this story, 'golgappu makes french fries'.